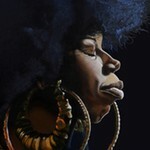 Part of the fabric of Los Angeles' hip hop/jazz/soul avant-garde since 2005, Georgia Anne Muldrow has built an impressive discography and a reputation to match during her career as a vocalist, songwriter, producer and musician. It is fitting that in 2018 Muldrow should sign to Flying Lotus' Brainfeeder - a record label deeply embedded in LA, with a ton of shared history and a united vision of the future - to release her stunning new album Overload. A modern soul classic in the making. An excited Flying Lotus shared news of Georgia Anne Muldrow's signing to Brainfeeder earlier this year, prompting knowing smiles and ripples of anticipation amongst fans and commentators who recognised the perfect symbiosis of their musical pathways, heritage and spirituality. Overload bears the fruits of numerous collaborations, most notably with Shana Jenson, Khalil and Mike & Keys (The Futuristiks) with Aloe Blacc, FlyLo and Georgia's partner Dudley Perkins as executive producers. There is a clear trap influence to the drum programming on cuts such as Overload and Play It Up. Many of the instrumentals here also have the same hazy psych jazz quality to them that was all over Kendrick Lamar's To Pimp a Butterfly. There Lamar's double-quick verses took centre stage, here it is Muldrow's deeply expressive voice which anchors the record. "Music is my discipline. It's my way of meditating, it's my way of thanking God, it's my way of communicating… it's my way of life. Overload is an experiment in restraint. I pack myself into something as clear as possible with the help of gifted artists from all over the world." Georgia explains. Brainfeeder has accepted the artist and the music as they are. Overload is pure Muldrow magic. "…Overload ranks among Muldrow's finest efforts." 8/10 Exclaim!